They’re back! Eagle Landing hosts the 11th Annual Eagle Landing Tennis Classic beginning April 10. This is the only yearly national professional tournament in the Jacksonville area. Many past competitors have gone on to reach the top 100 in ATP world rankings. In 2019, the ITF World Tennis Tour incorporated reforms regarding prize money and ranking points. Formerly known as part of the USTA Pro Circuit, the Eagle Landing Tennis Classic is unique in that community residents host players and officials in their homes while raising monies for charities. Some stay only a few days; others longer – especially if they’re winning! The $15,000 purse is supported in part by the ITF, East West Realty, Dream Finders Homes, Drees Homes, Peterbrooke Chocolatier of OakLeaf, Anthony’s Gourmet Catering and more. Most events are free to watch. Paid events support the tournament’s three charities: JP Hall Children’s Charities, MaliVai Washington Youth Foundation and the James Blake Foundation. Day session begin at 10am and night events start at 6pm. Subject to change – weather rules all! Eagle Landing, an East West Community, is a collection of distinctive family neighborhoods adjacent to the Jennings State Forest in Clay County, Florida. 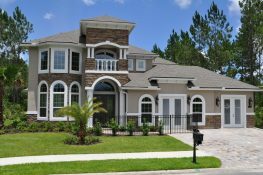 The golf course community of OakLeaf Plantation is located at 3973 Eagle Landing Parkway, Orange Park, Florida. Call the Athletic Department for information and match times at (904) 291-4343.